Whatever else you have to do, it's probably more fun than cleaning your bathroom flooring. So why spend more time than you have to getting it clean? The bathroom is used by every member of your house, and that means lots of dirty feet, which is why it's easy for dirt and grime to build up on your floor. Letting that dirt stay on your floor doesn't just leave you with lingering guilt week after week, it can actually cause damage to your bathroom flooring over time. This is because that grime doesn't just sit on the surface. Abrasive dirt particles can also make your bathroom flooring wear down faster. Maintaining your bathroom flooring with regular cleaning will save you money in the long run if you're a homeowner. Your floors will last longer, saving you the expense of having to replace them. Plus, you'll have the satisfaction of seeing clean surfaces whenever you look down at the floor. We all spend time in the bathroom, so why not make it look as nice as possible? So how do you get the most of your cleaning so that you don't have to spend more time than you have to on your bathroom flooring? It can be surprisingly simple with the right tools and know-how. 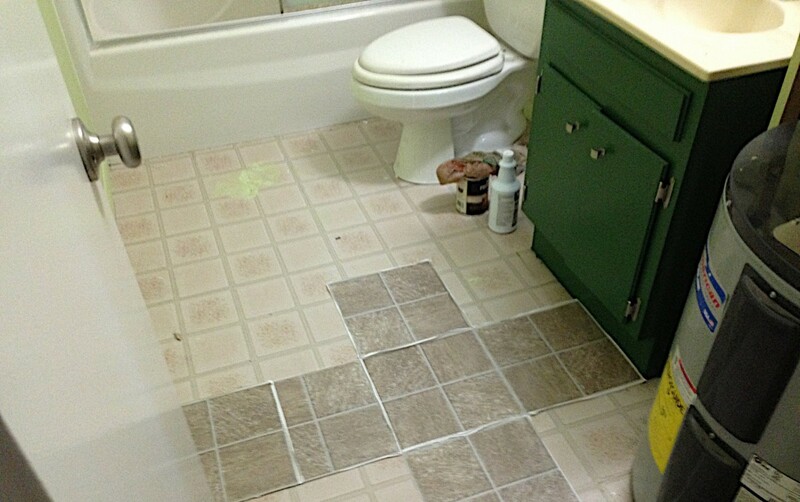 Read on to learn how to clean bathroom flooring without spending much time or money. ​​​​​You'll need different supplies for tile floors than for hardwood, and so on. But, in general, you'll need a broom or vacuum cleaner. For most bathrooms, the vacuum won't be worth the effort if it's rather large and clunky. Brooms tend to work better for getting around the base of the toilet and into other crevices. But if you've got carpet in your bathroom, or have a vacuum you love, then grab it. You might need a mop and bucket, but depending on the size of your bathroom you might be able to do without them. A sink can work just as well as a bucket, and a rag will do just fine in lieu of a mop. That is, if you don't mind getting down on your hands and knees. Of course, you may not have the time or would prefer a mop, in which case you might use a mop head with microfiber heads. Whether you plan to clean your bathroom flooring by hand or you'd prefer to use a mop, you'll probably want a pair of rubber gloves. Have a couple pairs handy in case you need a spare. If you don't have a mop bucket, you can use your bathroom sink instead. Substitute cleaning detergent with a quarter cup of vinegar and a tablespoon of regular dish soap. This plus two gallons of water will do the job of a heavy detergent for a fraction of the same price. Don't forget some clean towels you can use to dry the floors with when you're finished mopping. 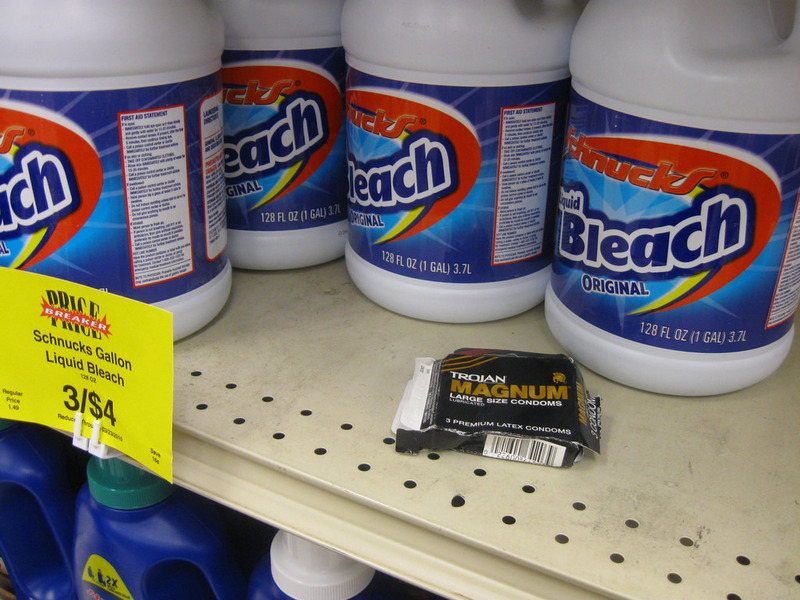 For the areas around the toilet, it's never a bad idea to grab some bleach wipes. They sterilize all kinds of surfaces and are safe to use anywhere in the house. Liquid bleach will come in handy too. To get really creative, grab a couple of ordinary tea bags from the pantry and a box of crayons. They'll be useful for cleaning and repairing hardwood floors. Borax, a cleaning product good for certain types of floors, can be useful too. Finally, you'll want a brush if you have tile floors with grout between the tiles. Since every floor is different, the techniques you can use to clean one type of bathroom flooring won't be ideal for another. So here's a breakdown of tips you can use for all varieties of bathroom flooring. ​Don't use acidic cleaners that can eat away at the tile. Also, make sure to avoid using a sponge as the excess water can sink into small holes or grooves in the tile and get trapped there. If you're using a mop head, be sure to ring it out fully before applying it to the tile. If you're using a rag, make sure it's damp but not wet. For the grout between the tiles, you can take a brush and submerge it in a combination of bleach and water for around 30 seconds, then apply the brush to your grout. Be careful not to let the bleach touch your skin. Always wear gloves before cleaning grout. Also, keep the bleach off your tiles as much as possible. Grout is especially susceptible to the buildup of bacteria, so be proactive. For the tile itself, you can apply your vinegar/dish soap solution to the tile and wait 15 minutes or so before drying it with a towel. Alternatively, you can apply any all-purpose cleaner and run the shower for 10 minutes or so with the door closed to let the steam and cleaner soak into the floor. Putting a towel under the door will help with this. While you don't need to bother with it if you're in a hurry, it's a good idea to apply a coat of wax to tile floors once a year to protect it from damage. This prevents water damage. Whenever possible, mop up water stains you find on your tile bathroom flooring with a towel. Those big bags you collected earlier will be useful in cleaning and maintaining the look of hardwood. 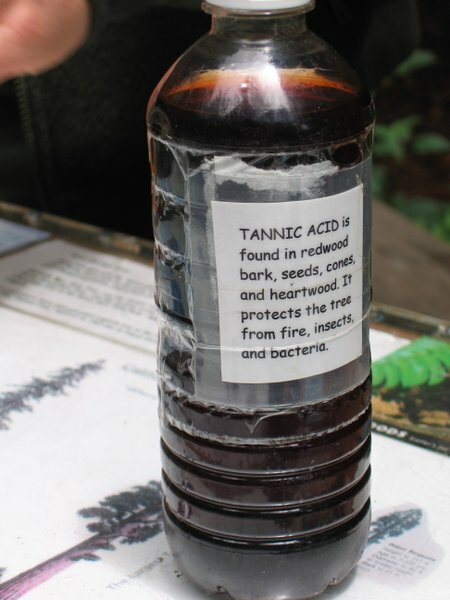 It's the tannic acid the gives the wood its sheen. Combine two tea bags with about a half gallon of boiling water and let it steep. Apply another half gallon of cool water, or however much you need to cool the tea. Now take a rag and soak it in your tea. Wring out the rag thoroughly and then apply it liberally around the tile. The result is a bathroom with a fresh, natural aroma that doesn't smell like chemicals. If you notice there are any dings or imperfections in the floor, you can take out a brown crayon and gingerly rub crayon into the scratch to make it disappear. 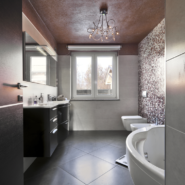 Make sure that the color matches the wood of your bathroom flooring. When you're done, you can use a hair dryer to heat the crayon and melt it into the hardwood. Remember that this technique is best for small scratches. 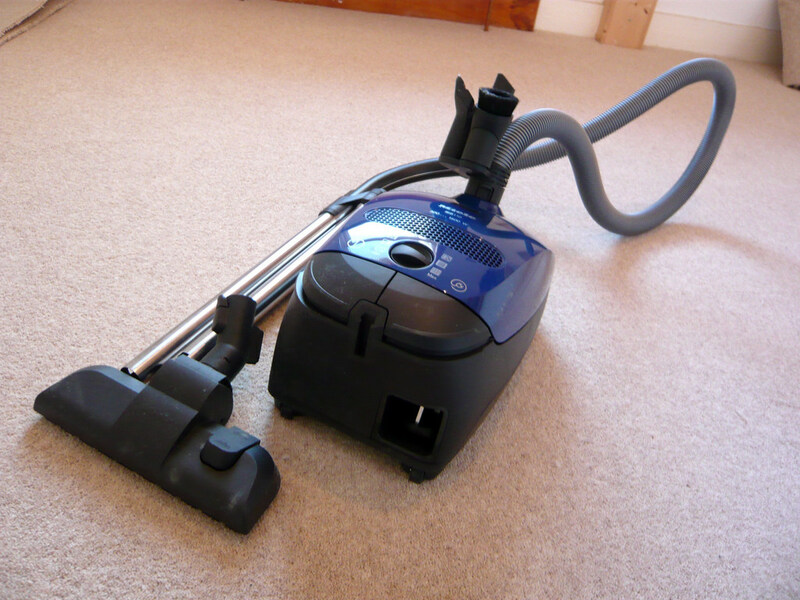 Your vacuum will be doing most of the work of getting up soil deposits that have collected at the top of your carpet fiber. Mops and rags won't be effective here, not even as a substitute for a carpet cleaner. 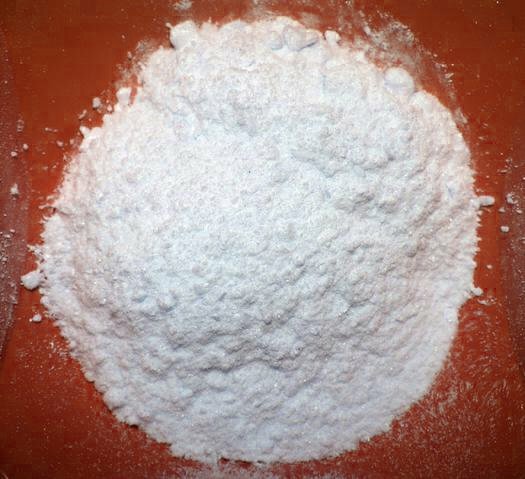 Borax can be your best weapon in cleaning a vinyl composite tile floor. Since there's no grout to worry about, you can skip the bleach and brush, but always be sure to sweep up with a broom before you apply the borax. With gloved hands, combine borax and warm water in your mop bucket and apply them to the floor. Wait 12-20 minutes and then dry any remaining spots with a towel. 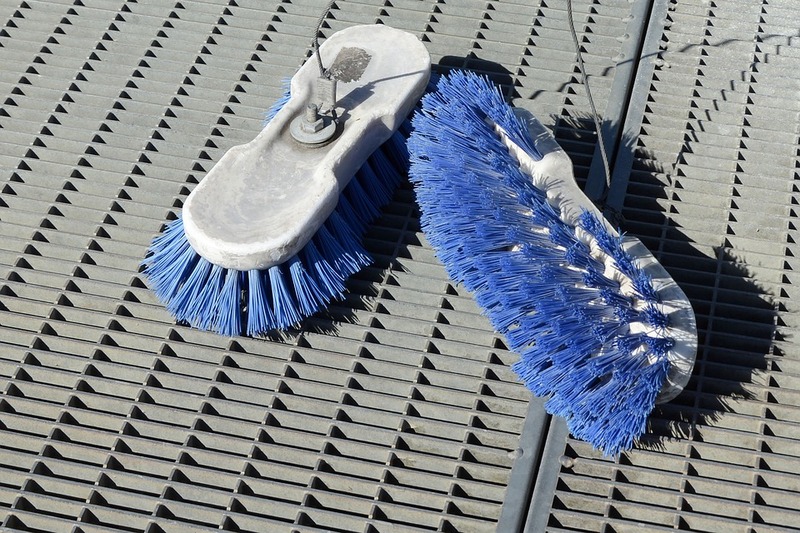 A scrubbing brush works best to remove dirt from concrete. Any all-purpose cleaner will do the job. Concrete is sturdy so you don't need to worry that about the cleaner damaging it. It's always best to begin by sweeping with a broom before you deploy a rag or the mop and bucket. Dust and hair are bound to be in those hard-to-reach places that a broom can reach around to sweep up. Just like painting a room, you want to start in one corner and work your way towards the door. Especially if you're working with harsh chemicals you don't want to have to walk across the area of bathroom flooring you've just cleaned. The most efficient system is to clean the floor section by section. You'll probably also want to tackle the bathroom cabinets while you're down there. If they're made of wood, they'll probably respond well to the tea treatment that you used on the hardwood, though only if they're unpainted. If there are windows in your bathroom, or you have a ventilation fan, use one or both of these after you've washed the floors to help them dry more quickly. This will save time and reduce the amount of effort you have to make to towel dry the floors later. The best method for cleaning your bathroom flooring isn't a single technique. Instead you should tailor your approach to the type of bathroom flooring you have and let that be your guide for how to clean it. Any kind of floor can benefit from some love and attention. 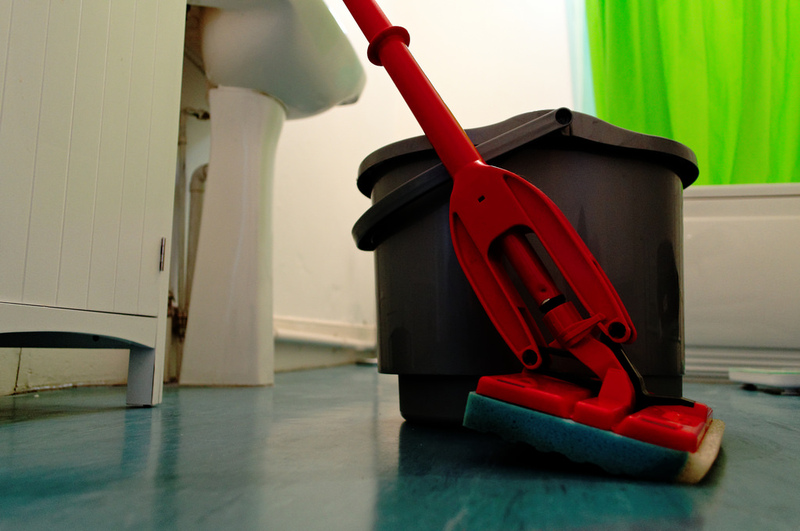 The best way to prevent your floor from getting dirty is to keep it neat whenever possible. Soggy towels, robes, and discarded clothes can all cause unseen damage in the long term if they're allowed to sit on the floor for extended periods. That's why it's always a good idea to tidy up daily. Doing this means you can clean your floors less frequently. If you're unsure of the best method to use on your floor, give some of these techniques a try, and see how they perform on your bathroom flooring. You might end up with floors you can really see yourself in. A clean home is a happy home, and the bathroom is the best place to start.